Our surgery at Whaddon Way has been at the heart of the community for many years in this hidden corner of Bletchley. 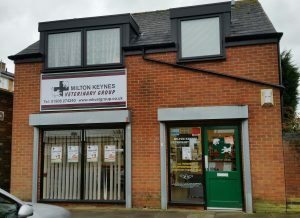 As our smallest branch surgery, Whaddon Way is a ‘consults only’ practice, but is closely linked to the main hospital at Walnut Tree and just minutes from our surgery at Stoke Road should your pet require any surgical or diagnostic treatments. Appointments are available Monday to Friday with our vets, for routine consultations, advice, vaccinations, health checks and repeat prescriptions.